Live:Air Action is an iOS video switcher application that turns your live stream into a complete multi-camera production with custom graphics, transitions, animations, and more. Live:Air Action is an ideal solution for schools to achieve a multi-camera setup to broadcast major school events, such as graduations, assemblies, or sports games. For schools with smaller budgets, Live:Air Action allows you to stream without the need for expensive, professional video cameras and instead lets you use the tools already available at your school. Since Live:Air Action mimics many of the functions of an expensive hardware switcher, teachers can use the app as a tool to introduce students to basic workflow of professional broadcasters. Live:Air Action helps you turn your video news coverage into compelling, professional quality broadcasts. Add titles, lower thirds, roll pre-recorded footage and much more to give your news stories a more authentic touch while making sure your content is delivered to online audiences around the world. For houses of worship looking to start or enhance their live production, Live:Air Action is an excellent and cost-effective way to begin streaming with just an iPad to produce a polished multi-camera broadcast without expensive equipment. Capture your services from every angle and improve engagement for both your in-house parishioners and online viewers. Having a professional live stream is a great tool for attracting new followers and spreading your message to the world. Looking to offer clients a cost-effective alternative to traditional multi-cam setups? Ditch the expensive hardware switcher equipment and stream with Live:Air Action. 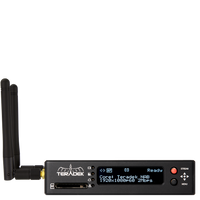 Utilize up to 6 wireless video feeds from iOS devices or connect Teradek encoders to your video cameras for super high quality live video ingest. Combined with custom transitions, animated graphics, and lower thirds, Live:Air Action gives you the portability and flexibility of a software solution with the polish and capability of a hardware based workflow. With Live:Air Action, every exciting play of a sports game can be captured to give your audience more to cheer at. Built-in scoreboards let you update scores in real-time, Instant Replay allows you to replay the last 30 seconds of the stream, and multiple angles ensure that you’ve got all your bases covered. Live:Air Action is the perfect app for IRL beginners and pros alike, offering a simple interface for adding graphics, URL overlays, and more to your Twitch, Facebook, or YouTube stream. Interact with you audience in real time by using the optional chat features or increase your donation visibility with StreamLabs integration. Live:Air Action makes it easy to capture every important aspect of any event. Concerts, speeches, weddings, and other events can be enhanced for you audience by offering alternative angles, unique graphics, and a more compelling overall presentation. Live:Air Action gives you the tools to do this all from your iPad. Stream your workshop, conference, or seminar live online without the hassle of heavy equipment and cabling. Live:Air Action simplifies the streaming experience, while giving you the power to expand your production quality with graphics, pre-recorded material, live remote video, and more. Record every stream directly to your iPad while you’re broadcasting live online. You can even record your entire event without an internet connection and stream it at a later time. Place up to 5 layers of custom graphics, lower thirds, text and more on your live stream with the touch of a button. Wow your audience with pre-recorded content, GIF animations or use the chroma key compositing add-on to take your graphics game to the next level. Choose between several different video feed transitions, including various dissolves, scaling, and swiping actions. With the built-in image editor, you can make final adjustments to each of your graphics and camera sources prior to placing them on your live stream. From Facebook Live and YouTube to Twitch and Periscope, Live:Air Action can stream on every major video platform in 1080p HD. Even if you have your own streaming server or prefer boutique platforms, the app’s ‘Custom RTMP’ option allows you to go live wherever you like. With Teradek Core and Sharelink integration, you can stream your live feed to multiple online video platforms at the same time, even if you’re going to several Facebook pages or groups. Add YouTube, Twitch, and Facebook chat to your live broadcast so you can address your followers directly. If you are a StreamLabs users, you can overlay URLs and integrate with the platform directly. Manual camera control allows you to set the exposure, focus, resolution, and bitrate of each iOS camera individually, right from the app. Show your audience two video feeds at once with the Picture in Picture functionality or display several video feeds simultaneously with the Multiviewer function. A fully featured audio mixer allows you to control levels and set parameters for each video source. Instant Replay allows you to capture 30 second video clips from each camera feed for play out at a later time. This feature is perfect for sports highlights, allowing you to relive the action throughout your live broadcast. Opt out of cables and go completely wireless with Live:Air Action. Simply connect your iPad to any WiFi access point with an Internet connection and you’re ready to stream live. Even if you don’t have an Internet connection, Live:Air Action can record your content for upload at a later time. Sometimes event spaces can be challenging for wireless workflows, but that’s not a problem for Live:Air Action. With Apple adapters, you can Ethernet your iPad, Teradek encoders, and other iOS camera feeds directly into your WiFi router, allowing you to continue your live production without interference. Capture your live event from every angle using iOS cameras or Teradek encoders attached to your DSLR, GoPro, or camcorder. With the free Live:Air Remote application, any iPod Touch, iPhone, or iPad can be turned into a wireless video feed for Live:Air Action. For the highest quality wireless video feeds, Teradek Cube and VidiU encoders can be attached to your favorite cameras and streamed directly into the Live:Air Action application. Link is a powerful WiFi access point designed for video production that ensures your wireless production is running optimally no matter where you go live from. Download Live:Air Action today to take your live production to the next level.